25 Days of Christmas #13 – Merry Christmas, Charlie Manson! You can just tell that you’re in for something completely off-the-wall just by looking at the title. The second Christmas episode in South Park’s run is one that, on the surface, is offensiveness at its peak, but manages to put some heart in an episode featuring one of the most notoriously evil minds in America’s history. This year, the boys pack into Mrs. Cartman’s station wagon to spend the holiday in Nebraska with the Cartman clan. It doesn’t need to be explained that the Cartmans are a hefty bunch and they all act just like Eric does. Stan, who doesn’t get permission from his parents, sneaks off to join his friends in the neighboring state. Little does anyone know that Eric’s jailbird uncle is about to break out of prison with his cellmate, Charles Manson, and head to the holiday festivities. The uncle and Manson take the boys to the Mall of Nebraska to see Mr. Hankey in person, but like a Mall Santa, it’s just some guy in a suit. The revelation causes a riot which Manson and the uncle are ultimately blamed for and it starts a high-speed chase that teaches Charlie about the true meaning of Christmas. 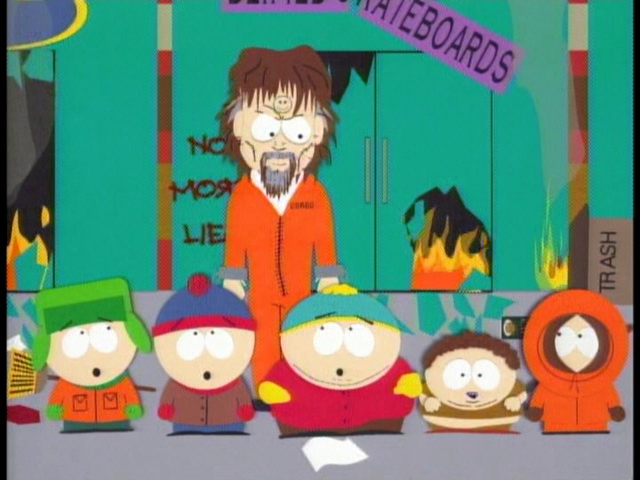 As funny as this episode is, it’s sort of forgettable when it comes to other South Park. It’s not as landmark of an episode as Mr. Hankey, the Christmas Poo nor is it nearly as fucked up as Woodland Critter Christmas. It’s an okay episode of a show that has done much better. I like the ending nod to A Charlie Brown Christmas and I like the characterization of all the Cartmans, but it is overshadowed by better festive episodes.